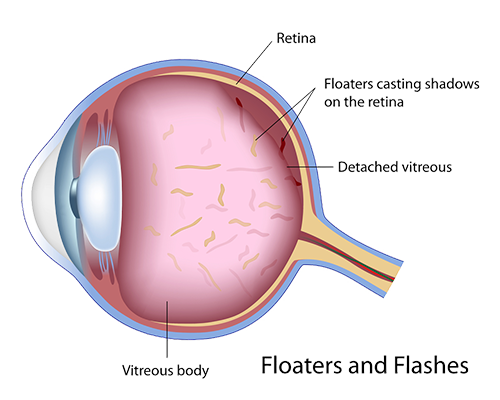 Eye floaters are the small spots and particles that tend to drift randomly within a person’s field of view. The clear gel that makes up most of the inner eye is known as the vitreous humor. As we grow older, the vitreous slowly changes from a gel like consistency to that of a liquid. Some of the remaining undissolved gel particles can then harden over time and float within the liquid center of the vitreous. Floaters tend to be especially noticeable when looking at an area of solid color, like that of a blank sheet of paper or up into a solid blue sky. The most common complaint associated with floaters is the obstruction of words when reading; glancing away and then back can sometimes help. Generally, an increase in the amount of floaters as you get older is natural and affects almost everyone. If, however, you begin to notice a large number of floaters and spots, with or without the presence of flashing lights, a more serious issue may be present. The retina is a thin layer of tissue at the back of the eye which captures light and then transmits impulses to the optic nerve. These signals are then carried along the optic nerve to the brain, which interprets the impulse as an image. If the retina is mechanically stimulated, a similar impulse can be produced and may be perceived as a flicker or “flash” of light. Such mechanical stimulation occurs when the eye is physically touched or poked. If the retina has developed a tear or detached from the back of the eye, similar episodes of flashing lights may be observed. A retinal detachment is considered an emergency and should not be taken lightly. An eye doctor can verify the cause of flashing lights in most cases through retinal imaging and dilation of the pupil. It should be noted that migraines and certain cardiovascular problems can also produce flashing lights. The eye is a sensitive organ, and good vision is one of the most critically important senses. Regular annual checkups with an optometrist are always recommended and can help reduce the chances of developing many serious eye conditions.